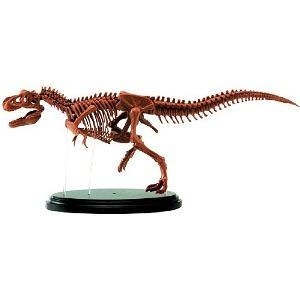 This Tyrannosaurus Rex Skelleton Kit is based on the latest research on the Tyrannosaurus that lived in the Cretaceous period. By assembling and observing this kit, you can research the ecology and evolution of dinosaurs.. A 68 page color guide book is included. Tyrannosaurus 1/35 Skeleton Model and Dinosaur Tooth, Trilobite, Ammonite Fossil Replica Creation Kit. Includes: Tyrannosaurus 1/35 Skeleton Model, Triceratops tooth, Hadrosaurus tooth, Iguanodon, Ammonite and Trilobite.